Dropbox. Slack. Spotify. Evernote. Box. Zynga. LinkedIn. Buffer. MailChimp. Wistia. Trello. Skype. Zapier. Think of the many SaaS apps you know and love. What do they have in common (aside from success)? More often than not, they’re freemium products. As a user, you’ve probably been tempted, if not swayed, by the upgrade prompts of a few of these popular freemium apps. As a product person, you probably know that designing a successful freemium product is really hard. If users are getting what they want from a free product, what incentive do they have to pay? And if users are not getting what they want, what will keep them from abandoning the product altogether? A well-designed upgrade prompt can be the key to engaging, and ultimately converting, free users. Upgrade prompts can serve different purposes, from simply reminding users to restricting actions outright, but they all need to pique the user’s interest. Successful upgrade prompts are subtle enough to keep users hooked to the free service, while ensuring that the consideration to pay looms larger and larger with each interaction. A common upgrade prompt is to restrict a “premium” action right when the user clicks. This is a sensible prompt that reminds users which features are premium and which are not. It can be a great way to build up the desire to upgrade. Imagine dropping a slice of pizza right when you’re about to take a bite—how much more do you want another slice? Since this approach stops users from doing what they want, the flipside is annoying users. These are the types of prompts that active users might see several times a day. Freemium products that do this well are usually persistent, yet empathetic, with their messaging. 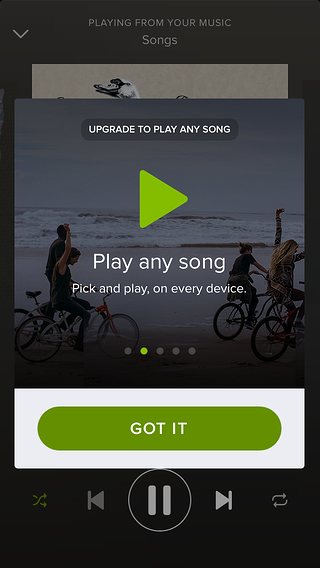 Music streaming service Spotify prompts for upgrades on mobile in a modal window series. 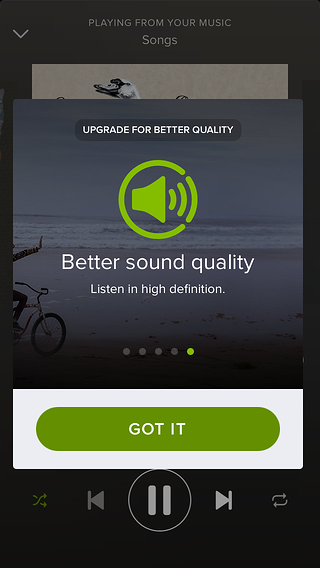 The modal series below appears when users try to skip too many songs. The same modals appear when users try to shuffle music over an ad, but the ad modal (#4 in the series below) comes first in that instance. 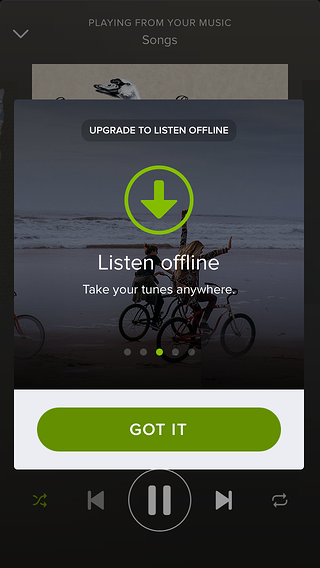 Active mobile users of Spotify might see these prompts a dozen times a day. 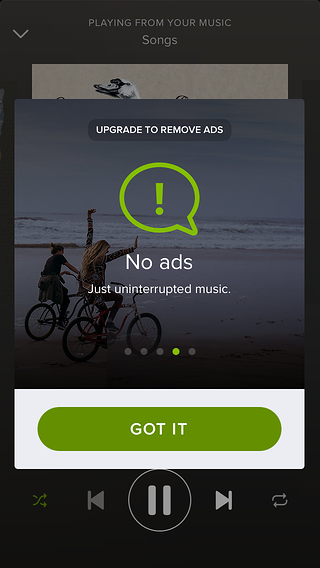 While having five modals in a series runs the risk of overwhelming users, Spotify uses very short copy and a large exit CTA on each. The approach also works because users can quantify and easily understand each of the premium features. Spotify’s impressive paid subscriber growth indicate that they’re onto something. 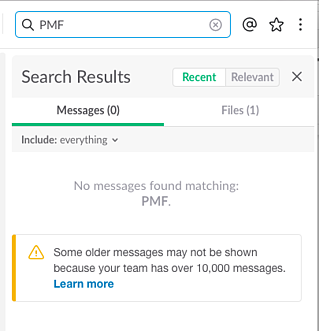 Teams (and individuals) can use Slack for free forever, but they are discreetly prompted to upgrade when they perform a very common function in the world of communications apps: searching through messages. Notice how Slack doesn’t mention payments or the word “upgrade” in their message. Instead, Slack hints that users could be getting more value from the service. Fittingly, the “learn more” link leads users to the pricing page. The understated prompt is a great and easy way to target users who have more urgent needs for a particular feature. Users who really want to search for messages will learn more, while users who don’t really need the feature can abandon the task without more thought. This level of insight into user behaviors demonstrates Slack’s commitment to the user experience. Instead of restricting certain premium actions before they happen, some products have subtle, but persistent, reminders placed throughout the product experience. 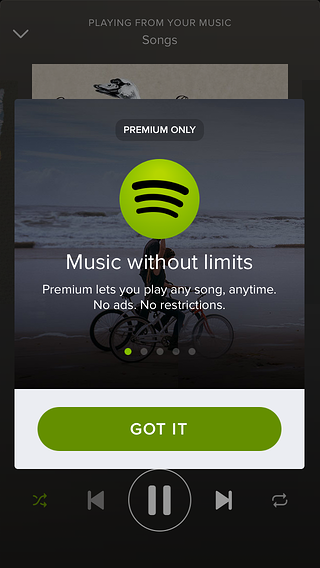 When users complete an action that is accessible in the free product, users are reminded of the added benefits of going premium. This tactic is great for saying “hey! did you know we can also do this?” without interrupting the user flow and causing friction. Users who want to explore can always read on, but users who just want to complete their intended tasks won’t be bothered. Depending on what type of reader the user is, this in-app message might be very enticing or completely irrelevant. By phrasing the upgrade prompt as a tip, Evernote doesn’t make assumptions of the user and comes off as a helpful service. 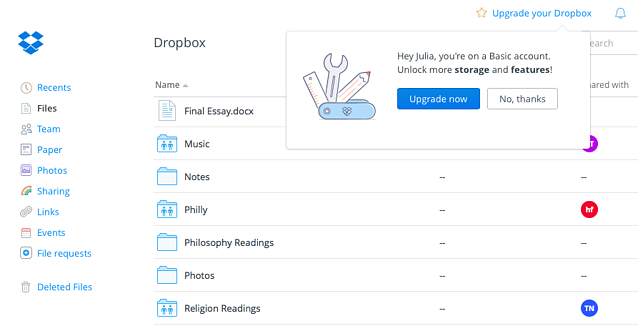 As an early and highly popular freemium product, Dropbox uses tooltips to remind free users that they can upgrade their accounts for more storage and features. This tooltip appears when a user visits the web page and isn’t prompted by a particular action on the page. While Dropbox’s paid product does offer additional security and support features, the biggest benefit of upgrading for most users is probably getting more space. Since there aren’t as many opportunities for gating features, using broadly targeted tooltips is a nice little nudge for users. Commonly used in newspapers and media organizations, paywalls require users to pay before proceeding to use the product, or read content. Soft, or metered, paywalls give users access to a certain amount or type of content. For example, the New York Times lets non-subscribers read 10 free articles a month. After you hit the limit, you can still browse the homepage and read links accessed through social media. In SaaS products, soft paywalls can be used to limit certain features or announce the end of a free trial period. Online form builder Typeform has a sleek and simple user onboarding process that leads new users directly into creating their first typeform. Typeform is free for anyone to use but has premium features, such as logic and thank you screen, available only to paid users. These features are non-essential for building a functional survey but are nice to have. The paywall itself gives users several options: upgrade now, trial a premium version, see the feature in action, or exit out completely. Users are not forced into a “take it or leave it” situation. Instead, Typeform understands that there are many different paths a user might take in the journey to becoming a paid subscriber. They allow users to explore and only upgrade when the time is right. While we’re not a freemium product, Appcues uses our own product to build a soft paywall that gives users the option to extend their free trial. We wanted to accelerate the buying process with the paywall, but we also wanted to give users some leeway if they’re weren’t completely ready to commit. When we first implemented the paywall, 66% of trial users who requested a trial extension and added their credit card converted to paid customers. Overall, we saw a 68% increase in the speed of sales after implementing our home-built paywall. Allowing users to extend their free trial let us build up some motivation for using our product, and let us know which users wanted to be more engaged. If you’re interested in using Appcues for your paywall, you can check out the paywall template we created or sign up for a free trial today. Offering discounts can be effective in converting users who are teeter-tottering between staying free and paying. A handsome discount could just be the thing to push them over the ledge and convince them to give premium a try. Brand new users who haven’t used your product at all probably aren’t at the point of debating cost yet. Discounts work best when users have demonstrated some sort of engagement with the product already. A limited-time push doesn’t hurt either. While the option to upgrade is infused throughout Grammarly, the grammar checking app drives urgency with a 40% off discount. 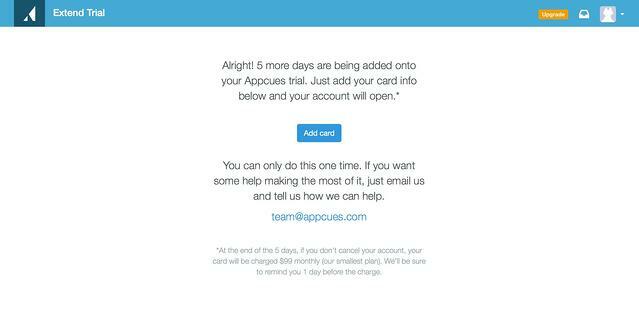 This promotion was announced in a two-email drip campaign over the course of two days. The short time frame of the offer tells users to act fast. 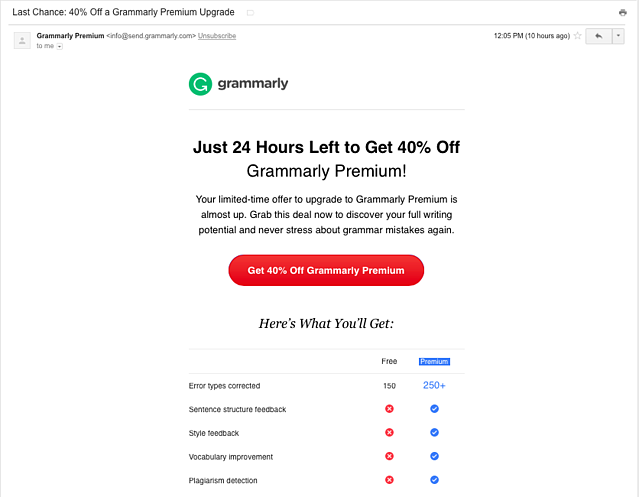 To increase the effectiveness of a limited-time offer, Grammarly may have targeted users who have a high email open rate. The email lays out the premium product’s benefits succinctly and has enough to appeal to grammar nerds and newbie writers alike. The meditation app Headspace uses a 6-email drip campaign over the course of a month to entice users to upgrade to premium. Like most of their animations, the GIFs in Headspace’s upgrade emails are fun and cheerful. The 6-email campaign could have bordered on too much outreach, but Headspace’s copy in the email above, “We can’t continue this offer forever, so we just wanted to give you the gentlest of nudges,” adds a human explanation and softens the volume of emails. Framing the discount as three months off (vs. a 25% discount) also makes the offer feel more substantial. Creating an effective freemium upgrade prompt can be a complex undertaking. Not only do you have to know what the incentive is, but you have to know precisely when and how to prompt users to upgrade. The upgrade prompts of successful freemium apps demonstrate an understanding that the user journey is varied and that there are many different paths a user can take from trying your product to paying for it. The cost of engaging freemium users incorrectly is high. Prompt them too much and they’ll get annoyed and leave; prompt them too little and they won’t give you a cent. Either scenario eats away at your profits.